To get to this mark simply follow all the instructions for the Sandy Craig,but instead of going down the steps to the old swimming pool,take the footpath to the left of the white shelter down from the carpark. As you walk down this path,you'll see the sandy Craig to your right.There is a set of wooden faced steps only 25 yards down this path.At the bottom of these steps you'll need to hop over the wire fence and you'll have seen by this time a white sandstone rock,heading down to the beach.A short,(I hesitate to say climb,it's a walk really),way down this rock there is a pretty flat area with a patch of grass on it.This is your mark. From this angle it's hard to see the flat area where you fish from,but I took the photo from here to show why it's worth fishing from.The tide in this photo is only 2 hours into the flood.It's best to fish it with much more water than this.2 hours before,to 2 after high water on a spring tide is ideal.The idea is that you cast out onto the sandy area that lies before the Sandy Craig rock itself. You'll just have to trust me that there is indeed room to fish from here.If you ever go there,you'll easily see what I mean. 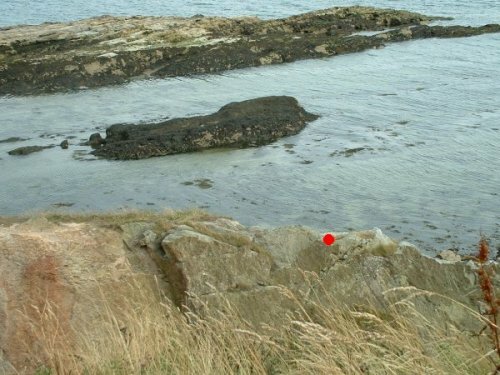 From this mark in the summer you'll have a chance of sizeable flatties,good coley and pollack with occassional cod sniffing about. You need a calm day though as it catches a lot of wind here and being sandy ground,you'll have a job holding your spot if the wind bows your line.It'll drag you constantly into the kelp edges. I've been looking for an ideal day to fish this mark in winter for a long time.When the weather is ready I'm not,and when I'm ready,the wind is howling,so I've never fished it in winter.I have a good hunch though that when there are big green cod about,this mark will produce. It's not a place for kids though,and even for adults it's a place to be very respectful of.